When you visit Italys Amalfi Coast be prepared to have your breath taken away by the magnificent scenery and the beauty of the glamorous and colourful resorts that cling like limpets to the near vertical cliffs that plunge into the Mediterranean. The spectacular road that connects the resorts of Amalfi is a tourist attraction in its own right. The Nastro Azzurro, Blue Ribbon, as it is known, winds its precarious way past fields of lemon trees, vineyards and olive groves, the wheels of southbound vehicles at times only inches from the edge of a precipitous drop. There isnt a roller coaster ride in the world that will give as much excitement. Here is a brief look at three of the most popular resorts on the coast. 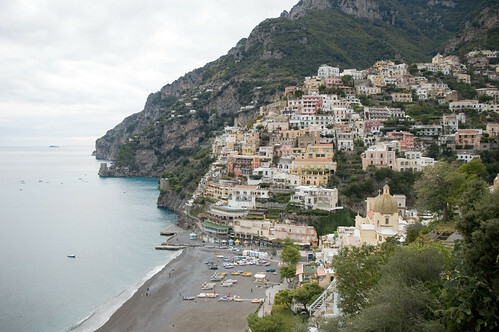 Positano is a typical Italian resort with a small beach, narrow streets and pizzerias around every corner. It somehow manages to subtly blend this homeliness with its world famous fashion boutiques and it is a favourite haunt of the jet-set and celebrities. Local building regulations stipulate that any new structures have to be built in the style of its surroundings, thus maintaining the olde world atmosphere. Its picture postcard views have drawn artists of the calibre of Turner and today the town is reminiscent of Montmartre in Paris, as tourists mingle with painters and haggle over the price of a watercolour. For those who enjoy walking Positano is at one end of the Seniero degli Dei, the Path of the Gods. This celebrated walk is around 500 meters above sea level and provides superb views of the Bay of Naples and the ominous outline of Mount Vesuvius. Ravello is the aristocrat of the Amalfi Coast resorts with its fine villas, landscaped gardens, fountains and statues. The Villa Rufolo is probably the most well-known villa in Italy, inspiring Wagner to write his opera, Parsifal. It is here that Music Concerts are held throughout the year on a huge terrace that seems to be suspended over the edge of the cliff. Although it has a more distinguished air than the other Amalfi resorts, Ravello has a bustling marketplace where local foodstuffs, wine and heavily-discounted designer brand clothing from Milan can be bought. For those who would prefer to view more exotic souvenirs, a visit to the Museo del Corallo, Coral Museum, is a must. Here there is a collection of cameos and other works of art made from coral. The museum is located on the premises of Camo, a workshop which specializes in the creation of coral jewellery, many of which carry a reasonable price tag. In its heyday Amalfi was an important trading centre on a par with Venice. 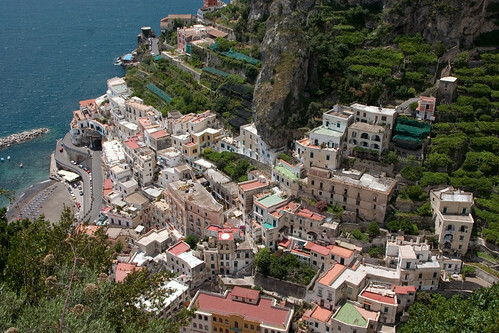 Modern day Amalfi is a town devoted to providing the best experience for its thousands of visitors. A highlight of any visit to Amalfi is a tour of the cathedral, centrally located on the main square, the Piazza Duomo. The cathedral is a mixture of Arabian and Norman architecture and has a charming tropical garden at the rear. Apart from its architectural beauty the cathedral is also important as being the resting place of the remains of St Andrew, brought to Amalfi from Constantinople during the Crusades. In the evening, after the day trippers have departed, Amalfi is a much quieter and relaxing place where one can find a seat on the terrace of a bar and enjoy a glass of wine whilst watching the sun slip down into the sea. Although the Amalfi Coast resorts have a wealth of luxury hotels and top-rated restaurants there is no shortage of medium and budget-priced inns and B and B establishments. Combine this with an inexpensive airline flight to Naples and a holiday on the Amalfi Coast doesnt have to break the bank.